My kids love snacks and any kind of finger foods. 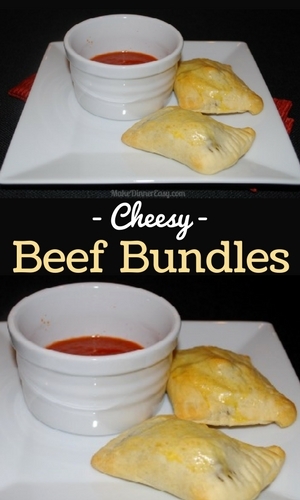 I made these Cheesy Beef Bundles for dinner the other night and they were a hit, probably because they were fun to eat and seemed more like a snack than dinner. Bonus, that the kids could eat these with their fingers and dip the bundles into pizza sauce. This is one of those forgiving recipes, you could easily substitute the ground beef for bulk Italian Sausage and add other veggies too. As they say, finger linking good! Special thanks to Maryanne W., a follower on Facebook, who helped me come up with a name for these! Brown the sirloin in a skillet along with the onion and garlic. When fully browned, blot if needed if grease is visible. Turn off the burner and add oregano, salt, and the cream cheese which has been cut into small pieces. Turn the burner on low and continue to stir until the cream cheese has melted and is mixed in. Turn off the heat again and stir in the mozzarella cheese. Place a small amount of the meat mixture on each square. Fold dough around to seal. 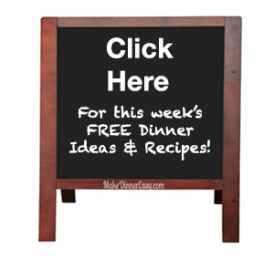 Place each bundle on a cookie sheet lined with parchment paper (if you have it, it will work without as well!) Press the tines of a fork around the edges of each bundle to seal. Brush each bundle with beaten egg. Bake these at 350'F for about 10 minutes or until the dough is golden brown. While the bundles are cooking, heat the pizza sauce. 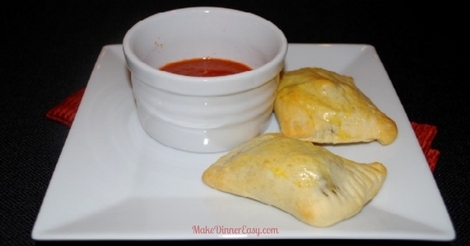 Serve the bundles with individual cups of warm pizza sauce or on a platter as an appetizer. Yield 16 bundles or enough for dinner for 4-5 people. If you haven't seen it yet, Pillsbury makes crescent rolls dough sheets. It comes in the same tube as crescent rolls do, but there are no perforations. If you can't find it you can use crescent rolls and form the pockets into a triangular shape.